I will never forget this art. No matter how hard I will try. makes Rob Liefeld looking good, my god, has the artist ever seen another human being? I still cannot believe this is the same Herb Trimpe who was one of the best Hulk artists ever. What the hell happened? If I had to guess, he's trying to imitate Valentino's art. What happened was that all the older artists were told in no uncertain terms that if they didn't tow the style of the prototypical Image artists, they weren't going to get work. 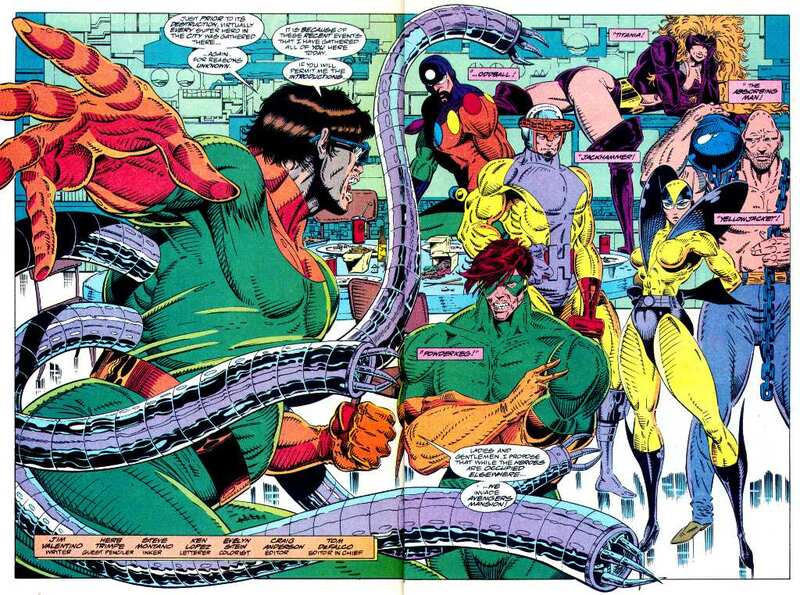 Guys like Al Milgrom, Herbe Trimpe, Sal Buscema and others were basically told that to adapt or die; good draftsmanship and an actual understanding of anatomy were considered something for has-beens. But the older artists really struggled to understand what fans wanted...this is a prime example of it. Trimpe wasn't the flashiest artist, but he was a solid artist who was the first person to ever draw Wolverine and the Wendigo, whose work ranged all over and deserved better treatment. 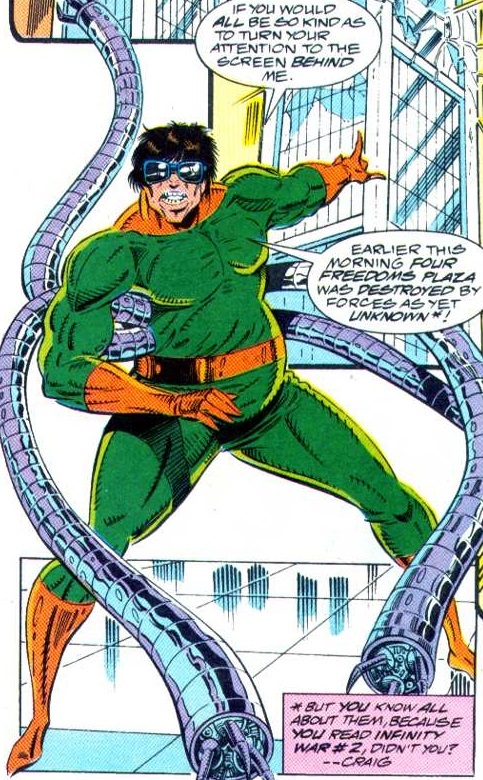 I love the footnote reminding the reader about Revenge of the Sinister Six -it's an unintentionally great underlining of a character going from a high to a low in the same year. Wow, Otto turned into a balloon there for a moment. But art aside, I like the idea of him wanting more easily controlled minions than the Six. 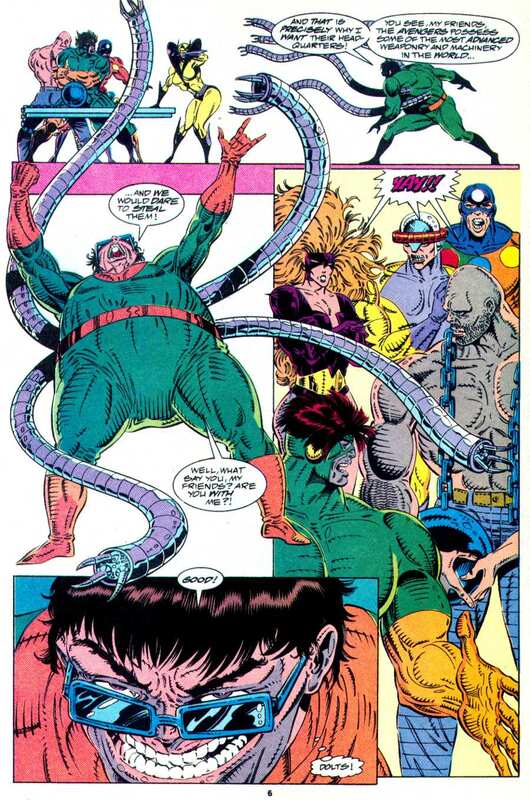 When you think about it, that team is a colossal clash of egos and neurosis, so it makes sense that someone as coldly logical as Ock wouldn't want to put up with their crap. TBH that's always been my problem with most Injustice Gang/Legion of Doom lineups, too. It makes sense to have an A-lister like Lex as leader, but why in the seven hells would he want everyone else's archnemeses as subordinates or even partners? Workaday B-listers like Parasite or Scarecrow or Silver Swan would be far less grief. Well, Lex did have a lower-rung Injustice Gang in Morrison's run and they got taken out fast so going for heavier hitters made more sense. Plus, he (justifably) figures he's smarter than all of them together so to him, anyone else is a B-lister. As for the Joker, as many have pointed out, it's better to have him on your side with a tiny modicum of control then exclude him, and have him sabotage you because his ego was hurt. I watched Enter the Spider-verse earlier this week, I can't go straight from that to this abomination. I mean look at those Otto drawings. He goes from having a Dad bod to looking like an inflating balloon to OH MY GOD THE TEETH. And his tentacles don't just drape over stuff limply they're always moving, or holding him up. 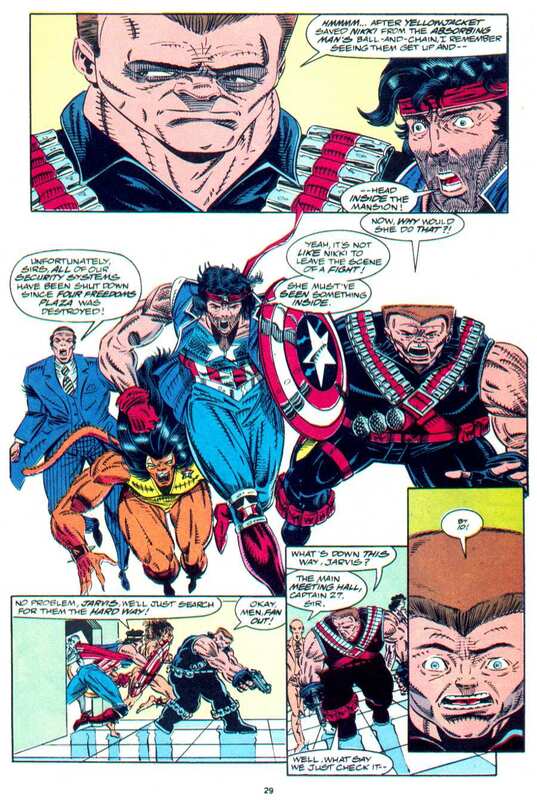 Also, this is the team you're invading the Avengers mansion with? 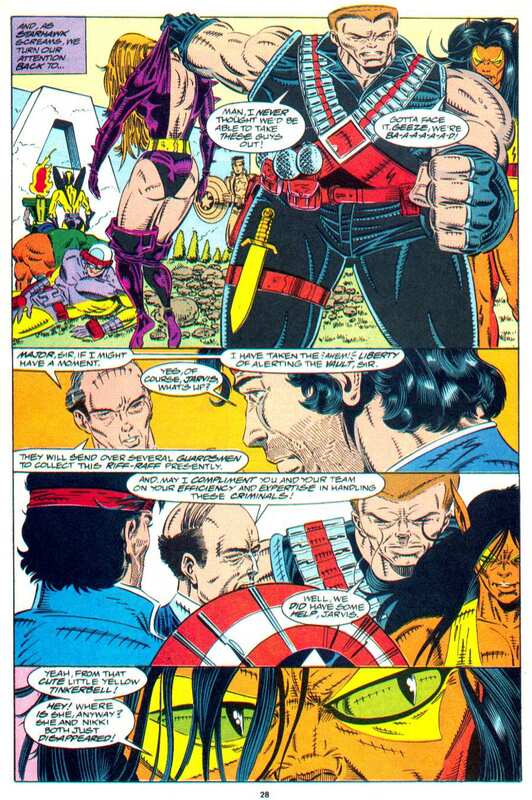 Titania and Absorbing Man are probably the only members of that lineup with any business fighting the Avengers. I mean Oddball? Seriously? I like to think these are the only ones who heard his call and didn't just hang up with "ugh, this guy?" He openly says he picked them because he could control him better and didn't realize just how lame they'd be until they actually went to work. Otto has always had an over inflated sense of self worth. 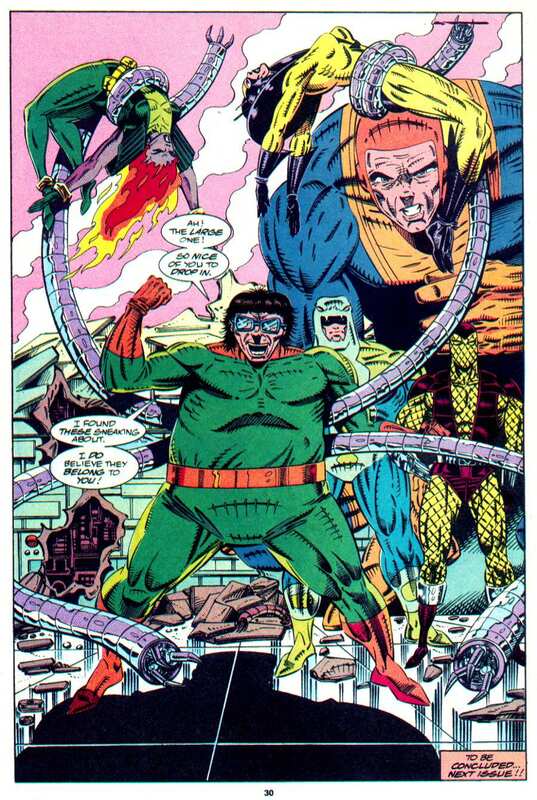 When he was first putting together the sinister six, he actually phoned up Doctor Doom of all people. Hell, the recent "Superior Octopus" comic has a bit where he openly slams the fact "I'm a real Doctor, unlike that poser Doom." A man who could crush Otto like a bug with ease. 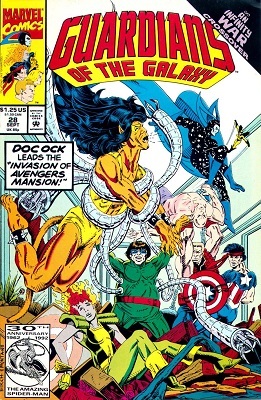 "We invade the AVENGERS MANSION! ...Powderkeg? What did I tell you? Orange and green is MY look! We can't both go invade the Avengers Mansion if people mistake us for each other." Ah, I see, Ock had a second team of B to C-listers that he didn't introduce to the first ones. Oh my WOW... How-- I mean... GEEZ! Herb Trimpe was the Hulk artist back in the '60s and '70s, so looking at this is extra painful... I desperately want to believe this is him mocking the direction Liefeld and co. were taking superhero art in, but it's at least as likely that his skills really did degrade that badly. I have no idea what the hell happened to him in the '90s that led to such a downgrade in his talent. He was trying to give them what they thought they wanted. Trimpe: I've been asked that question before, with some fans going so far as to feel sorry for the way Marvel made me change my style. Unfortunately, these were misdirected sympathies. Truth was, it was a lark--but a lark with a purpose, all devised by myself. No one at Marvel suggested I change the way I draw or ink. I looked at the new guys' stuff, and thought, hey, this is great. Very exciting. You can always learn from somebody else, no matter how long you've been doing a thing. I did, however, think the style might lead to new work at a time when Marvel was already in trouble, and it did. FF Unlimited was my last series at Marvel, and contrary to what a lot of fans think, I think it was the best work I'd done--and, I had a whole lot of fun doing it. Very expressive. I think the newer influences in comic book art brought out a better me. Like I said, most of the fans of the earlier stuff would not agree. On one occasion, I inked a whole story with a brush, which is what I was raised on, and the editor objected asking me not to do that anymore. But in general, no one pressured me into a change. He tried to follow the house style, but he achieved something else instead.